Torino fell to yet another defeat against rivals Juvenus as they were beaten 4-1 in a Derby Della Mole full of controversy. There was one surprise in the Toro line up as Gaston Silva was preferred to both Davide Zappacosta and Cristian Molinaro at left wing back. Juve took the lead after half an hour, as Paul Pogba scored for a third derby in a row - this time a free kick from fully thirty yards which Daniele Padelli will have been disappointed not to keep out. On the stroke of half time, Juve doubled their lead as Sami Khedira took advantage of a huge gap in the Toro defence to side foot past Padelli. Toro started the second half brightly, and were awarded a penalty after only three minutes as Alex Sandro was adjudged to have brought down fellow countryman Bruno Peres in the area. Despite being booked in the first half, referee Nicola Rizzoli decided not to produce a second yellow for Alex Sandro, and the Brazilian remained on the field. Andrea Belotti stepped up to convert the penalty, and ended Gianluigi Buffon's incredible 974 minute run of not conceding a goal in the process. That goal gave Toro renewed energy, and moments later they thought they had scored an equaliser. After another enterprising run from the impressive Bruno Peres, the ball fell to half time substitute Maxi Lopez who volleyed past Buffon, however the Argentine was wrongly adjudged to be offside. Toro failed to recover from that setback, and the game was over as a contest just past the hour mark when Pogba's exquisite ball found Alvaro Morata who finished well. Maxi Lopez almost gave Toro a lifeline following Marco Benassi's cut back but this time he was denied by Buffon. For the second derby in succession, Juventus scored a fourth goal as Paul Pogba's wayward shot was diverted home by Morata with fifteen minutes remaining. Once again it was derby day disappointment for the Granata who will now be nervously looking over their shoulders as they are now just five points above the relegation zone. Torino will hope to dent their rivals title hopes and rescue a disappointing season when they face Juventus in the Derby Della Mole on Sunday afternoon. Torino go into Sunday's game in horrendous form, having won only two of their last fifteen matches, with those victories coming against relegation threatened Frosinone and Palermo. Toro's terrible form was perhaps best encapsulated in their last game, as the Granata threw away a 2-0 lead at Genoa and ended up losing 3-2 to an average Grifoni side. However, in recent times (withstanding the 4-0 defeat in the Coppa Italia) Torino have produced impressive performances in the derby. Toro arguably deserved to win in the reverse fixture in October, before being cruelly defeated in injury time, and last season they finally ended their twenty year hoodoo against the Bianconeri with a 2-1 victory. With fan support of coach Giampiero Ventura at an all time low, the veteran tactician penned an open letter to Toro fans this week in which he urged them to stay behind their team. Ventura has an almost full strength team to choose from, with the only selection dilemmas coming at left wing back and central midfield. Cristian Molinaro has conceded two penalties in his last two games, and was sent off against Juventus in the Coppa Italia and his selection would almost certainly bring a negative reaction from the supporters, without a ball even being kicked. Therefore, Davide Zappacosta could come into the team, and this would mean Bruno Peres moving to left wing back. The other decision for Ventura to make is in midfield, Giuseppe Vives' experience and Afriyie Acquah's energy means they should both start so the final place would be between Daniele Baselli and Marco Benassi. Both players have had their moments this season, but with the former in poor form, I'd expect Benassi to be give the nod. Juventus will certainly have a number of tired bodies in their squad following their extra time defeat to Bayern Munich on Wednesday, but it is difficult to know how their players will react. Make no mistake about it, Juventus were excellent against the German champions for 70 minutes and will feel they did more than enough to progress before conceding two late goals and then succumbing in extra time. 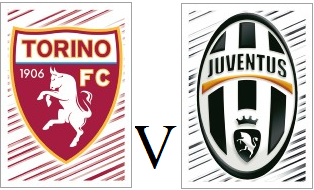 If Juve play as well as they did on Wednesday then Toro will have to play an almost perfect match to get a result. Whilst Gigi Buffon has kept ten consecutive clean sheets, and is only minutes away from breaking the Serie A record, the form of Andrea Belotti and Ciro Immobile has been the one positive of Toro's season and both players will be confident heading into this game, despite Buffon's record. And whilst it may be naive view to take, if Juve suffer a Champions League hangover and fatigue plays a factor, Toro have shown that they can raise their game against their rivals and therefore Toro fans may have some hope of gaining an unlikely victory. They do say it is the hope that kills you. Torino took a 2-0 lead within the first fifteen minutes but somehow contrived to lose in Genoa as they were haunted by a familiar face. Toro set out in their usual 3-5-2 formation, with Marco Benassi once again preferred to Daniele Baselli in midfield. The Granata took the lead with less than five minutes on the clock as Andrea Belotti provided a sublime assist for strike partner Ciro Immobile who beat Mattia Perin at his near post. Torino doubled that lead ten minutes later, and this time it was Afriyie Acquah who laid on the exquisite assist for Immobile, and the former Genoa man finished sensationally past Perin once again. However, the home side were gifted a way back into the match as Cristian Molinaro conceded a second penalty in consecutive games after a rash challenge on Cristian Ansaldi. Former Toro favourite Alessio Cerci stepped up to take the penalty and smashed it straight down the middle to half the deficit. In first half injury time, Genoa were awarded another penalty as Afriyie Acquah foolishly pulled back Armando Izzo at a corner. And it was Cerci, whose last meaningful kick in a Torino shirt was, a missed penalty against Fiorentina, but the former Viola man didn't make that mistake this time as he sent Padelli the wrong way. The momentum was now with the home side and with twenty-five minutes left Luca Rigoni headed home a Suso free kick, thanks in part to a shoddily assembled offside trap. Afriyie Acquah almost made amends late on, but his long range effort was tipped over the bar by Perin as Toro fell to yet another defeat. 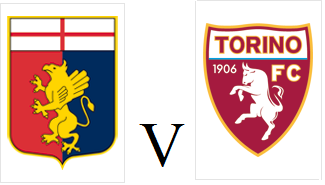 Torino have a near full strength squad to choose from when they face Genoa at the Luigi Ferraris on Sunday afternoon. With the derby a week away, Toro will be looking to go into that game in good form as a victory next week would go some way to improving a largely forgettable season. Genoa are unbeaten in their last five home games, winning their last two, and former Toro star Alessio Cerci could feature. Ciro Immobile's first half missed penalty proved costly as Torino could only draw 1-1 at home to Lazio on Sunday afternoon. Cristian Molinaro regained his place in the team, whilst Marco Benassi was preferred to Daniele Baselli in midfield. Toro made the perfect start and were ahead after only twelve minutes when Afriyie Acquah's shot could only be parried by Federico Marchetti and Andrea Belotti was on hand to tap in. The Granata should have extended their lead when Belotti was upended in the area by Danilo Cataldi, but Ciro Immobile blazed the penalty over the bar. Immobile came inches away from immediately making amends for that miss, but his excellent solo run culminated in his shot going narrowly wide of the post. Marco Parolo almost equalised in sensational fashion, but his exquisite half volley hit the inside of the post and bounced clear. However, with twelve minutes remaining, Lazio were awarded a penalty when Balde Diao Keita was fouled by Cristian Molinaro in the box. Biancocelesti captain Lucas Biglia sent Padelli the wrong way, and earnt the away side a point. Torino will look to improve their miserable recent home form when they face Lazio at home on Sunday afternoon. The Granata won their first three home games this season, but have only won two games at the Stadio Olimpico since September. Opponents Lazio have also been in indifferent form, and have drawn their last four away games, the last three of which have all been goalless.